"Welcome. I am so delighted that you are visiting my website. I hope that you enjoy the essence of my artwork as much as I enjoyed capturing the moment." Working in watercolors, oils and acrylic, Anita Gregorski's paintings capture the light and feeling of her subjects. "Watercolor and oil give me the freedom to experiment and my paintings are extensions of my views, feelings and thoughts. The satisfaction and joy I receive from creating a painting is a gift I will always appreciate." "I like to find that bit of nostalgia, record that weathered look, catch the light on fresh fallen snow and the new bloom on the flower from my garden. A paint brush and a few props and a painting gets created." 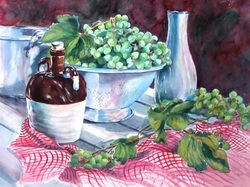 Artist Gregorski, Connecticut Artist has won numerous awards, and her work has been accepted in many Juried Art shows including the Salmangundi Club National Show (NY City) Northeast Watercolor Society National Show, The Art of New England National in Lyme, Academic Artist National Exhibit, The Connecticut Watercolor Society Shows, and The Connecticut Women's Artists. She has had many local solo exhibits.